I received this eyeshadow duo from Zuneta today as a Christmas gift. I had to share it with you immediately. I have never ordered from Zuneta before, and am not very familiar with the brands that they stock. 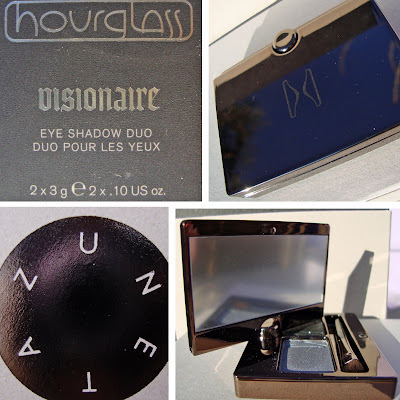 The brand 'Hourglass' was created by Carisa Janes in LA which was launched in Sephora in 2007. The first thing that strikes you about this brand is the glossy bronze luxurious packaging. 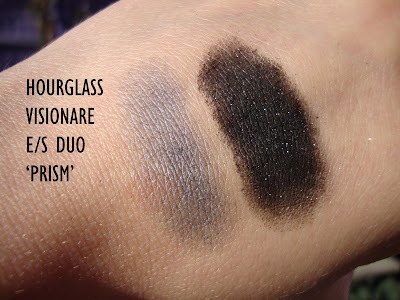 The duo in 'Prism' includes a blue toned gray and sparkly black, perfect for a smokey eye. Here are the swatches... They are quite buttery and smooth but I also found them slightly powdery. The black is extremely pigmented, but the gray isn't. The colours are nice, but nothing that isn't already out there. The size of the product is similar to a Nars e/s duo, just ever so slightly smaller. I like all my eye shadows to be the same size as it makes life a lot easier when organising. :) The duo includes a little brush and the lid comes with a mirror which swivels all the way around. Personally, I think this is priced quite high. I would rather buy a Nars shadow. but, I do love the packaging and imagine I would feel rather special using it! @Lina oo metallic red :)good luck with it.